Lauren & Maurizio’s wedding was such a BLAST I’m sure people will be talking about it for years to come. After spending a lot of time getting to know L&M we collaborated with their wedding photographer, Camelot Photography Studios, and hit the road in route to the abandoned Simon Silk Mill in Easton, Pennsylvania. The Mill was constructed in 1883 and consists of a series of run-down buildings with tons of dirt, broken glass and debris. In other words this was THE perfect location to film an insane creative / engagement shoot. Our plan was to shoot something super edgy, prior to the wedding, that would truly showcase their personalities. We were interested in exploring their relationship as a couple and how we could connect that with the wedding and make their wedding film truly unique. On location Lehigh Valley’s number-one spinmeister DJ Fly literally tore-it-up! He kept the music pumping as we worked our way throughout the dilapidated compound. Flash-forward to the wedding day. Lauren and her bridesmaids’ got ready at the Hilton Hasbrouck Heights, New Jersey. They checked-in before the wedding which really took the pressure off traveling the “day-of.” Our bride looked spectacular in her Lazaro wedding dress from Bridal Garden in Marlton, New Jersey. Our groom was rockin’ his Ike Behar tuxedo. Father Manolo performed a beautiful ceremony at St. Joseph’s Church in Maplewood, New Jersey. Afterwards it was over to The Venetian in Garfield, New Jersey along with 260 guests. Lauren & Maurizio hired an authentic London Taxi to take them from the Church to The Venetian. What a cool experience! Once at The Venetian it was easy to see why The Palazzo Ballroom is New Jersey’s top wedding destination. The staff is top notch and the room looked spectacular. The floral design by A Touch of Elegance literally transformed the ballroom (it even smelled great). Carla Friday, the owner of Details Made Simple, was a real gem and worked hard to coordinate everything! If you’ve never heard the Opera 3000 band you should. They kept the dancefloor packed all night. As the party progressed there was so much energy in the room that Maurizio literally jumped on stage with his saxophone and jammed a few songs with the band. This was yet another in a series of very special once in a lifetime moments (we haven’t forgotten about Lauren’s dance with her Dad 🙂 As a finale L&M honeymooned in Napa Valley, California and Corsica & Sardinia. When we work on a wedding film of this magnitude it takes a lot of planning and preparation. This was one of the times I was totally psyched and couldn’t wait to start brainstorming with Lauren & Maurizio so they would have an unforgettable experience. They’re a good looking couple with great families and friends but even more importantly they’re such nice people. 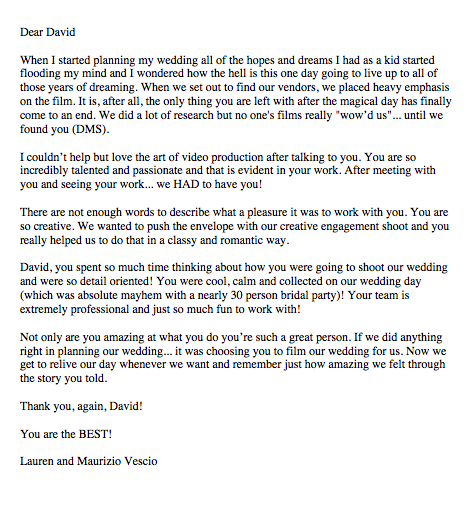 In the world of wedding cinematography I’m always hoping to meet couples like L&M. Stay tuned for their over the top wedding film. PS – Your new house is AWESOME! IMPORTANT – Lauren & Maurizio’s Wedding Preview Film is available to view in both High Definition (HD) and Standard Definition (SD). The HD version is vastly superior in every possibly way. However to watch in HD you might need a little patience as the clip will have to buffer (load) into your computer. 1. Make sure the letters “HD” in the lower right hand corner are blue. 2. Click Play. 3. Quickly click pause. 4. Allow the clip to buffer (load) for a minute or two. 5. Click Play. 6. Enjoy!